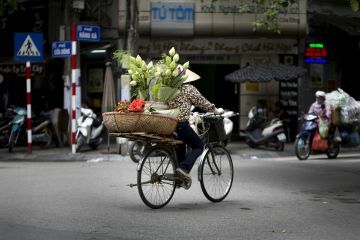 Thank you again for our wonderful experience in Hanoi. It was such a pleasure to meet you and your family, your hospitality most delightful. The colours and flavours of Hanoi made a perfect escape and I think we’ve found a new joy so very close to home. Thank you Lynn for the introduction and thank Mai for being our guide and host. Thank you and all the staff at Journeys to the East for a fantastic trip to Vietnam. We really valued the ability to be able to tailor our activities to our interests and thank you for your suggestions on alternative activities as you got to know us. Our day cycling around the villages was a great addition to our itinerary, and the breathtaking beauty of Ha Long bay from the air will stay with us for many years. You even found us a field of dragon fruit to see! We really valued your professionalism and enjoyed your company. We look forward to our next trip! Having now been back at home for a week, we are finally catching up with the backlog of mail and emails..
First, many thanks to you, Mai and Chinh for arranging our trip to Vietnam and making sure we were so well looked after while we were there. We really enjoyed ourselves and appreciate how your knowledge and contacts enabled us to see things which we would otherwise have missed. At a more personal level, we would like to thank you and Tony for your generous hospitality when we were in Hanoi. We loved your house and appreciated being made to feel part of your family. We so enjoyed meeting Laura - she is a lovely girl and a credit to both of you. I am sure that she and her sister appreciate how lucky they are to have found you both. While we were in Hanoi we touched on the possibility of seeing you all when you visit Megeve in 2017. Let us know when you finalise your plans and we will see if there is any way we can get together. In the meanwhile, we send our very best wishes to you, Tony and Laura. First of all Michèle and I would like to thank you for the warm and generous welcome you extended to us during our stay with you. The staff at your residence in Hanoi were very attentive to our needs and your secretary was very professional.Excellent staff that meet with your aspirations. There is so much to say about our journey through this magnificent scenery,a visit from the north to the south filled with curiosity and enjoyment. Each day we made a new discovery and were welcomed into peoples' home, who despite the little they had were extremely generous. We all appreciated the total change of scenery, the folklore of the different ethnic groups,the diversity of their customs and the discreet nature of the native people who make this region so stunning. Well done Journeys to the East for the quality of this Travel Tour which was organised splendidly from start to finish without a flaw.We all appreciated the professionalism of this unforgettable adventure. Our time spent in the south brough back memories of 2013, we enjoyed the bike rides, journeys on the Mékong abord the sampan accompanied by an attentive,dedicated team, visits to the coconut fields where we were able to watch the various operations linked to this product found in abundance in the region.In short,our day to day discoveries were thrilling and enriching. 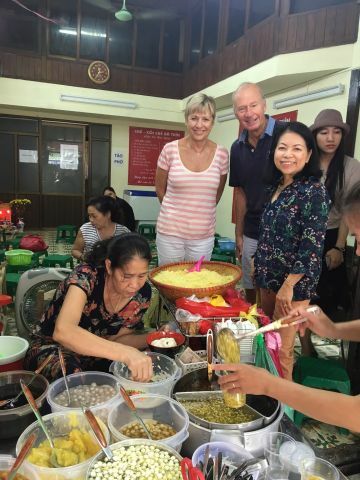 Finally, the "cherry on the cake" was our stay with you in MUI Né. A sumptuous residence,a wonderful place where we were totally pampered. The chef worked incredibly hard to serve us refined cuisine and the rest of the time was spent relaxing at the villa or by the pool. The time went by too fast and as all goods things come to an end we returned to Paris with a feeling of nostalgia but fascinated by all these experiences. from Paris &Porto Vecchio France.